Just a random pick today. For the next couple of days we've got some special features... tomorrow is a Thanksgiving special, and Friday will be the... three-hundredth daily post here at the ol' blogstead. I've got a few ideas for what #300 will be... hopefully I'll be able to settle on something fun. Anyhoo... enough housekeeping... let's check in on Kyle Rayner as he pops the question... no, not that one. We open with Kyle getting the stuffing knocked out of him by Sledge who is an absolute mountain of a man. Kyle sees him as a threat, however, Sledge is doing his best Hulk impression... saying he just wants to be left alone. He swats Kyle into a building and leaves him laying under the resultant rubble. While the battle raged, our narration was excerpts of a letter Kyle was writing to his mother. The note is mostly about his current cohabitation with the former superhero Jade. By the time Kyle is able to dig himself out, Sledge is already long gone. It's just as well, however, because Kyle has some Green Lantern business to attend to over at Warriors. He has arranged to meet with three former Earth-based Lanterns, Alan Scott, John Stewart, and Guy Gardner. 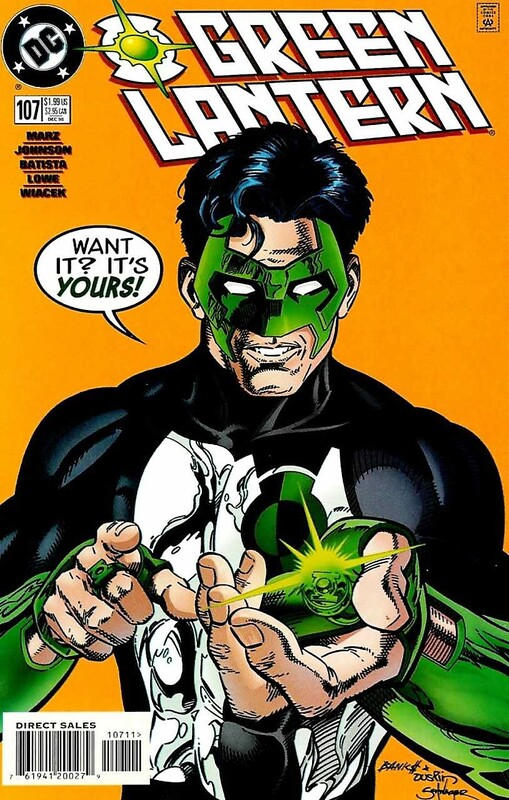 Ya see, in recent issues Kyle Rayner had a team-up with, of all people, Hal Jordan. This was a time-displaced Hal, not yet at his Parallax-worst. At the end of their team-up, Hal gave Kyle a self-replicating copy of his own Lantern ring, and urged him to rebuild the Corps. To do so, Kyle will have to go off planet for an extended period of time. As this would leave Earth without a Green Lantern, he needs to find an interim replacement. His first offer goes to... well, the first Green Lantern, Alan Scott (and not just because he's shacked up with his daughter). Alan notes that, while he was the first Lantern... he was really never officially a member of the Corps. He is flattered by the offer, but decides to pass. The next offer goes to John Stewart. He also appreciates the thought... but feels he is not yet ready to wield the ring again. He recounts all of the things he had lost while being a Lantern... his wife, an entire planet... he's just not ready to "go there" again. Which leaves Kyle with a smilin'-like-the-cat-that-ate-the-canary lookin' Guy Gardner. He surprises Kyle... and I'd assume a lot of the readers, by also declining to take the ring. He is happy with his new lot in life as the proprietor of Warriors, and as the on again off again Vuldarian superhero, Warrior. The "old guard" apologize to Kyle and suggest he find someone more willing to take on the temporary mantle. Kyle considers Connor (Green Arrow) or Wally (Flash) as his replacement. All he knows, is that whoever he chooses, they're going to have a lot of tradition to live up to. And so, Kyle heads home. He is greeted by his live-in girlfriend Jade who is pretty surprised that he couldn't find a replacement. She thought, at the very least... Guy would have jumped at the opportunity. She begins hinting that she might "know a gal" who would be interested in filling in. Kyle thinks this is a great idea, and slides the ring on her finger. She instantly manifests a classic Green Lantern costume (with mask). Kyle suggests she zazz it up a bit, and put her own spin on it... which gives us a fun little fashion show. She ultimately decides to stick with the classics... but loses the mask. After getting "fitted" Jade is chomping at the bit to hit the streets and "do stuff". They do some pleasure flying throughout New York City and wind up in Central Park where Kyle hopes to have more room to "work". Well... wouldn'tcha know it... there's Sledge! Kyle and Sledge get back down to business, trading blows and tree stumps until... Jade interrupts. She is... and I'm assuming here because the art is a bit iffy... seated in a seductive pose to distract the baddie so that Kyle can kayo him with a construct of an anvil. With the job done, we head to the end... and a pretty abrupt shift in art style. Jennie has now held the ring for a week, and is ready to officially take over as Earth's Green Lantern. She and Kyle share a final conversation in which they replicate Hal's ring, and a kiss that has to hold them both over for the foreseeable future. We close out with Kyle heading skybound in search for the new (and, spoiler alert... disappointing) Green Lantern Corps. I really enjoyed this issue. It's part action, part day-in-the-life, and Marz is able to put it all together in a great package. I've always been an Earth-bound Green Lantern fan... I always prefer the comparably more mundane Lantern tales than those that take place in outer space. I always start to lose interest when Kyle (or Hal... or whoever) heads off into space (Green Lantern: Mosaic is my exception), which is why this story works so well. If we want to follow Kyle on his quest... we can pick up the New Corps miniseries. The main Green Lantern title will follow Jade while she takes care of Earth-bound issues. Best of both worlds. I think, upon reflection, what I appreciate most about this issue (and this era) is that DC was moving forward. We had characters like John Stewart and Guy Gardner leaving the superhero world behind... moving into their next stage of life. There was just such a feeling of change... all of which has been undone in the decades that followed. Superheroes don't retire anymore... they just keep hanging on. Nothing changes. Instead we just get reboots and de-aging. I would say that my biggest complaint here would be with the mishmash of artists. Most of the pages looked fine enough, however... the one page that springs immediately to mind is the one where Jade sits seductively by the tree... I mean, c'mon... how goofy does that look? She looks completely uncomfortable... chuckle-headed and cross-eyed. Unless Sledge has some strange tastes, I just don't see how this gets him so distracted. Overall... worth checking out. This was a fun era for the character and the title from a time in which the DC Universe was actually progressing. A time, sadly, long forgotten.